“There’s absolutely no food in this house.” This statement, usually delivered with a dramatic sweep of the arm and a pointed stare at me, is uttered now and again by my teens. 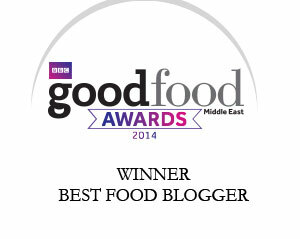 This is despite rather strong evidence to the contrary (full cupboards, a packed fridge). What they mean is that there is no food in the house that they’d like to eat right at this particular moment. After weeks with the house full of visitors, we are out of routine so when this was last uttered I directed them to a notepad and pen so they could add their essential staples to the shopping list. But bread was one item that I refused to buy. New year, clean slate time – it’s back to home-made. The silence of the kitchen when everyone is out at school and work; the joy of working from home so I can pop down from my office after each stage of proving; the pleasure of welcoming the teens home after a hard day with a loaf still warm from the oven. Oh bread-making how I’ve missed you. Whole wheat would wait for another day, but the astringency of rosemary is completely in tune with a simpler diet after the excess of the last few weeks. I piled flour and salt on the counter, mixed yeast and date syrup into water barely warm from the kettle and poured it into the mound to make a mini-lake. Drawing the flour from the edges little by little with a fork to form a thick swamp, I then swapped to my dough scraper to fold in the edges to make a shaggy pile. Plastic scrapers are all the rage but I love the smooth, wooden handle of mine. Finely chopped rosemary was added as I stretched and folded with rhythmic kneading, the silky dough becoming speckled and smooth. After proving, shaping and rising again, I slashed the top, lay a branch of rosemary on one loaf and slid them into the oven. Several squirts from my water spray into the heat pierced the calm with intense hissing. The teens ate slices spread with butter. Inspired by the Grana Padano pairing with honey at Cucina Caldesi I added a slice of Parmesan and more date syrup (a good quality one from Baker and Spice). Anything makes a great sandwich with this bread but you could use Brie and grapes, cold lamb and redcurrant jelly, chicken with salad in a lemon oil dressing or thinly sliced smoked pork with slices of apple. I’m joining in with the Twelve Loaves theme of a clean slate this month. Cake Duchess has the details and lots of other bread baking inspiration. Go on, join us – make a loaf today. 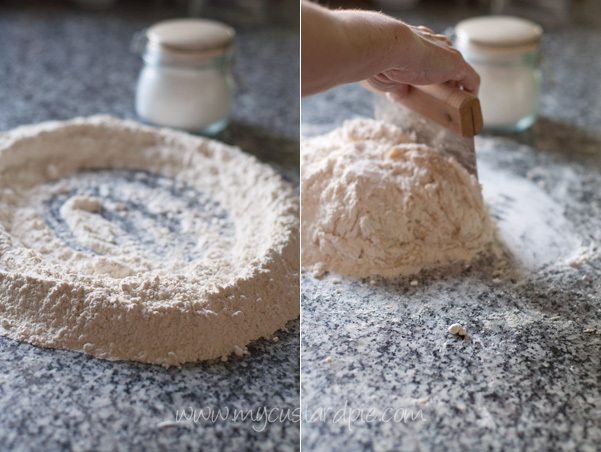 Put the flour and salt in a pile on the work surface (clean with enough room to move) and make a very large flat well in the centre, keeping a wall of flour round the edge. Dissolve the yeast with the date syrup in the tepid water, mix with a fork and pour the liquid into the well. Use the fork to incorporate some flour from the edges of the well, a little at a time. When the consistency of the liquid centre is quite thick (i.e. won’t run all over the surface) switch to a dough scraper and fold the outside edges into the middle. Keep doing this until you have a shaggy pile of mixture in the middle. If the dough is too dry add a little more water. Do not use more flour though – it shouldn’t stick and you can scrape everything up with the dough scraper. Make a dip in the top of the dough and add the chopped rosemary. Fold the dough over it and start to knead gently; continue for about 10 minutes until a smooth, elastic ball of dough is formed. Put the dough in a large bowl covered with cling film or a cloth and leave to double in size (about an hour). If you have made double the amount this is the time to cut the dough in half. Shape your loaf by flattening it gently into a round (like a thick pizza) then rolling it up. Place it on an upside down baking tray lined with baking paper, seam side down. Leave to rise again so it doubles in size (45 minutes to 1 hour). Meanwhile heat the oven to 200 C with a baking tray or baking stone inside. Slide the loaf gently onto the heated baking tray or stone – I keep it on the baking paper and find this helps. Give several vigorous squirts from a water bottle into the oven and shut the door. Turn the heat down to 180 C. Repeat the squirting after 15 minutes. Remove from the oven after about 25 minutes, when golden with a crisp crust. Cool on a rack. 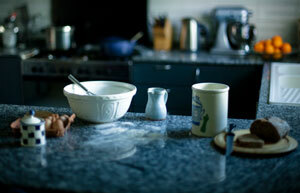 What are you are going to make (or eat) as part of a clean slate at the start of the year? Eat the chocs and make the bread – perfect combination I’d say. wonderful…. the real bread campaign is also very interesting! Yes – I support the real bread campaign. The Chorley Wood method of baking has a lot to answer for. Lovely bread recipe that would also go down well in my house! a new must make recipe! Thank you Sally!! Thanks to you Karin for a lovely comment. Ahhhhh….that first paragraph could have been written by me, Sally! Word for word! I’ve also started showing them the cupboards and then handing them paper and pencil. And I love this bread, love it. I may try and duplicate it. Beautiful. And a very happy new year! Happy New Year to you Jamie – and I found twelve loaves through you so thank you. printed the recipe. love the use of date syrup and i have plent in stock right now ready to use. It is an every day luxury isn’t it Rosa. 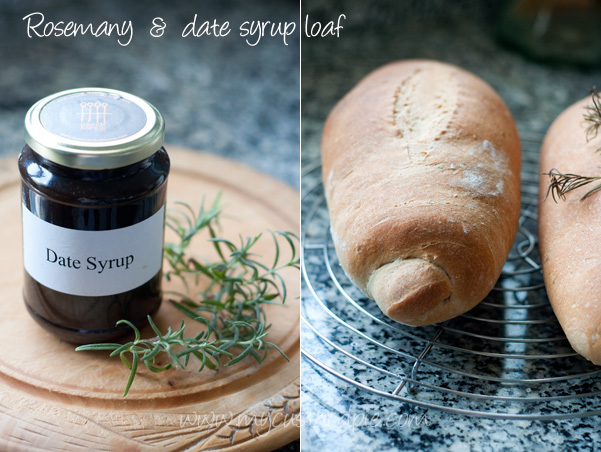 What a lovely loaf – I really like the sound of date syrup and since I don’t know where to buy it I’m wondering if I can make something similar simmering dates in sugar syrup? Sounds wonderful with rosemary too. I did see how to make your own date syrup somewhere the other day…but the good quality stuff only contains natural date sugars. I would use maple syrup instead. Oh Sally, what a remarkable loaf of bread! I made a seed loaf just the other day but nothing as impressive as this. How lucky your teens are to come home this this. Seed loaf is next on the list Mandy. Making bread is one the great pleasures in life! What a great recipe, thanks! Ciao Sally, I think so that we need diet for the excess of the last weeks! Your rosemary bread is perfect!!! Back on course for simpler eating. Ciao Lucia. I’d love to see what he bakes. I’m shuddering at the thought of microwave cheeseburgers! 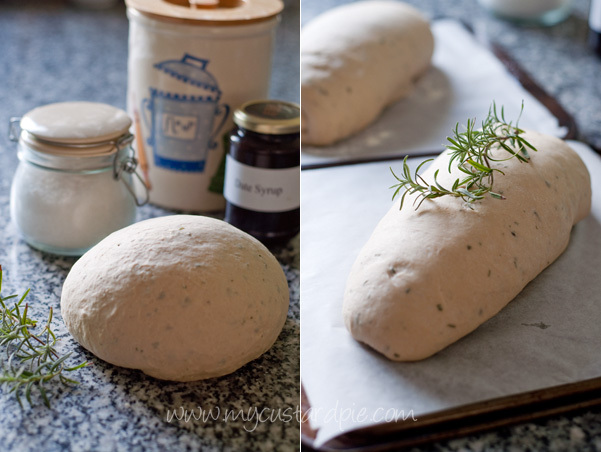 I love making & savouring home-made bread too & your step by step guide is really cool! MMMMM too! What an absolutely gorgeous idea for a loaf! I love the combination of herbs with sweetness so can imagine rosemary and date is divine! No real sweetness evident, just a foil for the rosemary – but a love ingredient to work with. I usually make 4 loaves so as to fill the oven. When our boys were teenagers, one loaf would disappear when they came out of the oven. The two of us are more moderate now but still enjoy my homemade bread. I should make more at a time – good idea. Girls try to be picky but then can’t help themselves with a warm loaf. I had that very same cry from my husband – nothing ready to eat. I shall have to get onto baking today. I love your clean slate idea – hope you manage to keep it up. Teens do morph into husbands don’t they! Love your description of the bliss of baking bread while working from home. Something I feel very lucky about too. 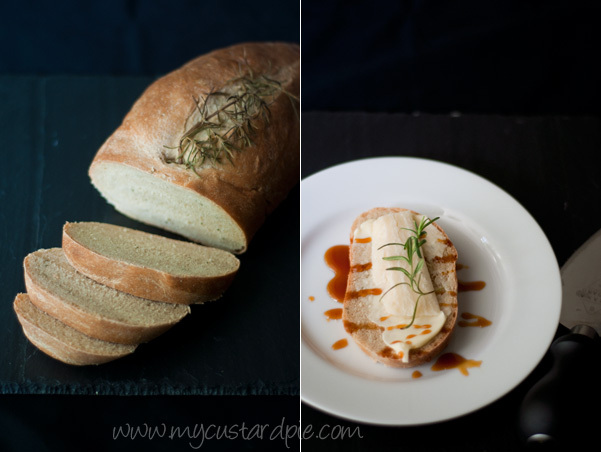 And your bread looks wonderful – date syrup and rosemary, parmesan too, how heavenly. Baking bread is only second to a walk in the countryside for me – sadly one thing I don’t get to do very often. Ah more inspiration for my ‘learn to bake bread’ resolution! This looks like a brilliant recipe, thanks for sharing. Your bread looks spectacular, Sally! Rosemary is one of my favorite herbs..,a big slice of this bread would be marvelous with some cold butter or a slice of cheese. I’ve enjoyed a few more successes with baking yeast breads and you’ve inspired me to make another loaf soon! 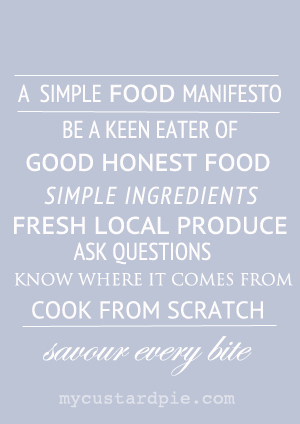 Totally agree about rosemary – it’s one of my favourites too. Thanks for stopping by. It’s available everywhere here but some date syrup is pure and some is filled out with sugar syrup. Worth finding a good one – you’ll be eating it out of the jar with a spoon! I love the languorous way you describe your bread making. I fI weren’t dashing out this very moment I would be tying on my apron and joining you. I need to look out for date syrup. I have many syrups but not his one. Those loaves are so gorgeous! I will definitely need to try this bread. We have a flourishing rosemary plant in the garden right now. 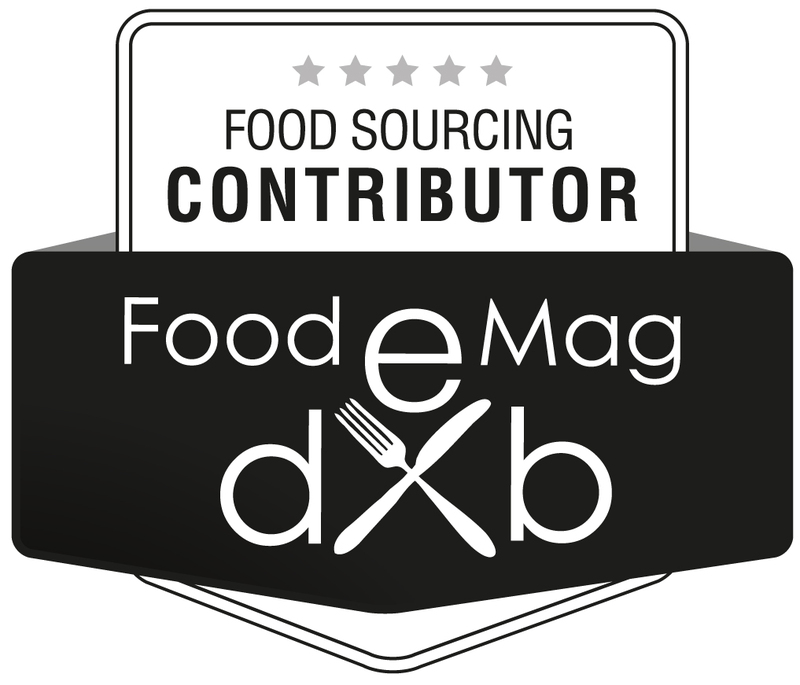 I’m set on making foods from cuisines I’ve been ignoring lately– the vast sweep of Mediterranean cuisines, Asian food. And always, more raw foods, even if it’s just a quickly chopped veg/nut topping for a stew. Sally, such pretty photos! I have date syrup in the pantry, thanks for the suggestion, I’ve been trying to think of uses for it! 🙂 PS. I love the sprig of rosemary on the top! That is one beautiful looking loaf , I absolutely love this , I am bookmarking this recipe . Sally, this is truly divine! Can;t wait to try it. A truly gorgeous loaf, Sally. On our very clean slate this year is French bread – in many guises. So far, we’ve had Pain L’Ancienne which turned out gorgeous. And the kids are taking a serious liking to an olive foccacia, which is a change from pizza, so I am pleased. It’s an art to make good French bread. Bravo to children who like olives – mine loved them from toddlerhood thank goodness. My men are the exact opposite …. they say there is far too much food in the house! LOL! I am so loving this bread and I have been thinking of baking more bread at home this year. Living in Germany one is so spoilt for choice when it comes to good bread … but I think I need to set myself the goal of having at least one quiet bread baking day a month! You inspire my friend! I have never seen a bread recipe that calls for date syrup, Sally. What a great idea. I grew up on the stuff but ate it at Passover, with crushed walnuts and matzo. For true decadence, my dad poured it into frying or scrambled eggs. I don’t fancy date syrup on eggs but I’m going to try it anyway! Date syrup, that´s the first time I hear about it but who can resist anything with dates? It´s a gorgeous bread! We have fig syrup here, argentina, so I will give it a try. I’ve never heard of fig syrup before – so we’ve taught each other something new. I love the feeling when you’re eating home baked bread, especially when you’ve also got home made butter to go with it… or olive oil from a friends olive trees… simple pleasures. I’ve been baking a lot of Soda bread as it is fast and I don’t have a lot of time working 7/7. This loaf looks gorgeous, I wish I could buy date syrup here, must have a look at whole foods next time I’m in London. Oh and I recently discovered that I’m allergic to something in factory baked bread, I get tummy ache but I’m not gluten intollerant. It must be one of the other nasty things they put in there!